Diane Setterfield's Bellman & Black begins with a group of boys arguing over whether one of them can kill a rook with a catapult. To his own surprise, Will Bellman manages to fell the young bird, although he feels no triumph over having done so - only a powerful sense of fear and remorse. Some years later, Bellman is taken on my by his uncle, brother of his estranged father, to work at the family mill, and from that point on all Bellman's business interests seem to turn to gold, making him a successful man as well a popular one. The only poor luck he ever seems to experiences are the periodic losses of people close to him - but that is to be expected in the Victorian period, surely, when deaths occurred more quickly, more randomly, and to younger people than we've come to expect today ... and yet Bellman soon comes to believe that when his friends and loved ones die, they aren't doing so at random, and that only he can break the pattern. Bellman & Black is billed as a ghost story on its cover, which is, while not entirely inaccurate, is somewhat disingenuous. Bellman is certainly haunted, but whether by a spirit or something of his own creation, it's hard to say. 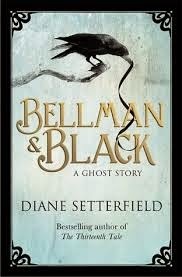 The story reads much more like a gothic-tinged fairytale or fable of guilt and grief, and its solidly linear narrative arc, punctuated only by the occasional interjection on the nature of rooks, has all the straightforward simplicity of that genre (in that sense, Bellman & Black is almost the polar opposite of Setterfield's previous novel, The Thirteenth Tale). Although beautifully written, Bellman & Black doesn't leave much room for character development, and, rather oddly given the subject matter, a little lacking in atmosphere. The period details are well-chosen, and the ending has a strong sense of tragic myth and is satisfying in its inevitability, but rarely was I really gripped, and there were no real surprises or stand-out moments as the story rolled steadily on.